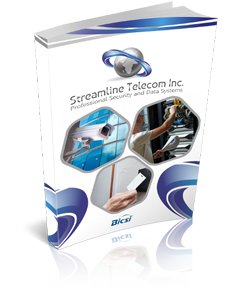 Streamline Telecom’s network cabling services include the design, installation, and maintenance of systems for voice and data communication for offices, data centers, schools, hospitals, and other commercial buildings. Streamline Telecom can install a variety of audio/visual equipment typically used in commercial buildings. This includes TVs and speakers for conference rooms, microphone systems, projectors, video conferencing systems, and touch panel control and room scheduling systems. How important is information, security and communications infrastructure to your business? Is it important to you that the phones in your business ring when customers attempt to call you? Is it important that your business environment be safe and free from crime? If day-to-day operations in your business are disrupted by technical glitches, would your business lose money? Are you interested in reducing losses from employee theft? Does your business have important assets that need to be protected? Is it important that your customers and employees have good cell reception and high-speed wireless internet access in your place of business? Do you have any proprietary information that needs to be protected and monitored? Do you have a need to remotely access and control data? All of the issues raised by these questions fall under the umbrella of information, security, and communications infrastructure. The importance of these systems and the technical nature of their design, installation, and maintenance requires the expertise of a specialized contractor. These contractors are sometimes referred to as ICT contractors (Information and Communications Technology), data cabling contractors, or structured cabling contractors. Working with one of these specialized contractors can save your business significant amounts of time, money, and frustration—but only if you choose the right contractor. At Streamline Telecom, we’ve noticed that while there are many ICT contractors in the city that charge for their services, there are very few that can be considered true professionals. When we describe ourselves as true professionals, we mean the following: Training: Our technicians are trained to the highest standards available in our industry. Communication: We are attentive to the needs of our clients and respond promptly to all questions or concerns. Reliability: We do exactly what we say we will and show up on time, every time. Fair: Our rates are fair for the services we provide. We offer competitive pricing near the middle of the pack within our industry. We believe that we provide a high level professional experience and installation for our clients. Our installations are top of the class but also done right the first time. Experience: We use our knowledge and familiarity with the industry to give our clients solutions that meet their unique needs, instead of providing one-size-fits-all solutions. If this describes the type of ICT contractor or integrator that you’d like to work with, then look no further than Streamline Telecom.